Azalea is trapped. Just when she should feel that everything is before her... beautiful gowns, dashing suitors, balls filled with dancing... it's taken away. All of it. Entwined is a wonderfully original retelling of the classic Brothers Grimm's The Twelve Dancing Princesses. Ever since I was little, I've adored the tale of a dozen beautiful sisters dancing in a secret land. I was thrilled to see that an author finally attempted to bring this story to life in a new light. 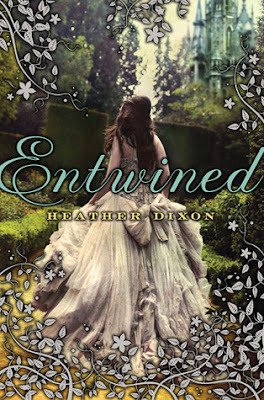 Unlike some books, Entwined was easy to immerse myself in. The magical castle and fascinating descriptions of the dances the girls partake in were lovely to read about. One of my favorite aspects of the novel was the closely-knit family. All twelve sisters loved and supported each other through thick and thin. Dixon also focused on the father-daughter relationship, which is a rare thing to find in a young adult novel. Azalea, our heroine, was relatable on a new level for me. As the oldest of six children, I completely understood her feelings of protectiveness for her younger sisters. Instead of playing the typical, self-centered teenager, Azalea was mature and put her family first. I loved her from the first page. It is often difficult for me to find young adult books set in the medieval time period that are written appropriately. Many authors write dialogue as though their characters were from the twenty-first century. Others write with such historic accuracy that I can barely understand what the characters are saying. Dixon, however, found the perfect balance of modern language and the lyrical style of olden days. Overall, Entwined was a captivating read of magic, family, and light-hearted romance, as well as lots of dancing. I'd recommend it to any fantasy lover, as well as those who appreciate a well-told story.